Treat your taste buds to a fresh berry delight with this succulent blend of blueberries and black tea. Our Blueberry Black Tea features whole blueberries and fine black tea leaves, blending two rich flavors for a deliciously natural tea experience. Indulge the blueberry lover in you with every sip of Blueberry Black Tea. After 3-5 minutes the tea will develop into a deep cranberry hue. The aroma is best described as grassy, floral and fruity. We use only the highest quality of organic freeze-dried blueberries that are visible in each bag and blended with the finest Darjeeling black tea. This refined blend is an exciting and vibrant medium bodied tea that opens with a crisp vegetal tone and a tinge of moss. A refreshing burst of citrus creates and uplifting element of a fruit filled infusion that invigorates your senses. The closing notes have a subtle hint of woods with a fruity, flowery finish. If the fresh taste of blueberries brings a smile to your morning, you’ll be thrilled with the enriching taste of Wild Blueberry Black Tea. This enchanting fruit blend features real pieces of northern wild blueberries paired with the smooth, balanced taste of Darjeeling black tea. The result, an authentically delicious blueberry taste without the use of any fillers or flavorings. Rich in taste and featuring just the right touch of caffeine, this berry tea blend can add a touch of luxury to your morning routine. Easily the best part of a breakfast muffin, blueberries are rich in a variety of nutrients. These flavorful fruits offer exceptional amounts of vitamin C, vitamin K and manganese, and their natural sweetness ensures you’ll never need to add sugar. The black tea leaves also add potent antioxidants, giving you several new reasons to give this delectable blend a try. 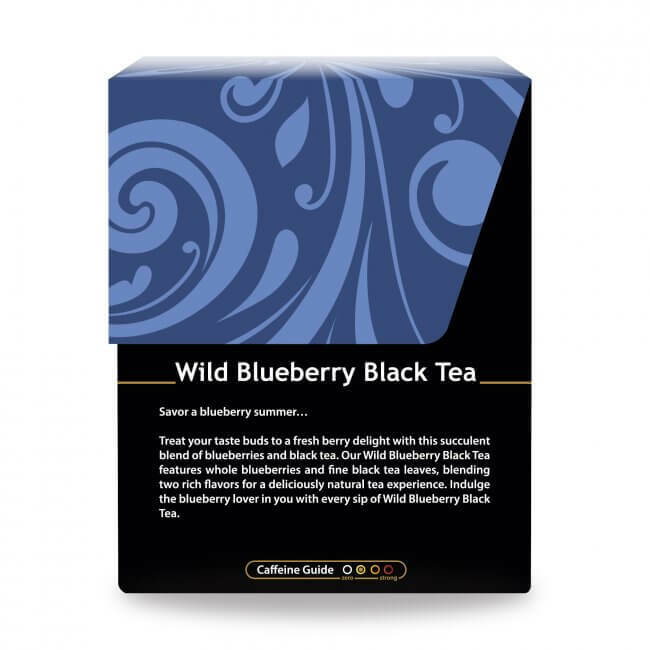 Whether you’re an avid tea drinker or simply a fruit fan, Wild Blueberry Black Tea is a refreshing option. An exceptional addition to any collection, this tea makes an enticing treat and an excellent gift idea. Buy in bulk and save with our discount pricing, plus all US orders of $50 or more receive FREE ground shipping! 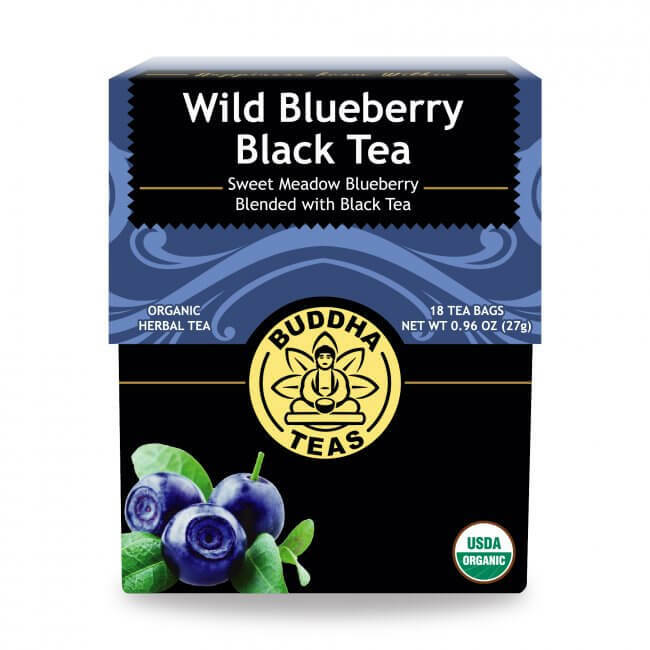 Brighten up your day with Wild Blueberry Black Tea! Great blueberry taste - highly recommend. Made some sun tea with some of the blueberry teabags, very refreshing. If you like a great black tea this is great with a hint of blue berries. Very enjoyable tea. Awesome morning tea for me. A little bit of caffeine kick combined with great flavor. Great way to get the detoxifying benefits of wild blueberries. I taste the blueberry fruit flavor but i wish the black tea flavor was stronger. I would buy it again! 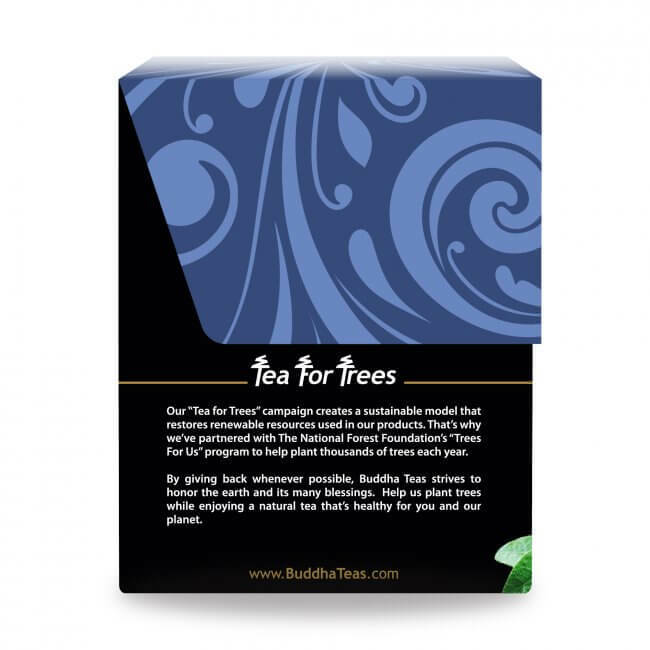 I love the buddah teas! It is delicious. Not too strong, subtle flavor. Highly recommend. It's a great way to get blueberry antioxidants into your system. I love it! I normally like black teas infused with fruit so I was very excited to try this flavor. Unfortunately I feel it is much more of a berry tasting tea than a black tea and I tend to not like berry teas. I recommend steeping this for a shorter amount of time than usual or the berry flavor gets pungent quite fast. If you like strong berry flavor then this tea is for you. This was great. The blueberry comes through very well, with a nice balance of black tea. I like that it contains real fruit.